Not for the 800 but for my 93 Sprint. I have a replacement cover but on looking at it it's probably going to be a bit too much for me to do a good job. Any suggestions as to who I could sent the seat and cover to who could recover it. Original cover has been glued and stapled. 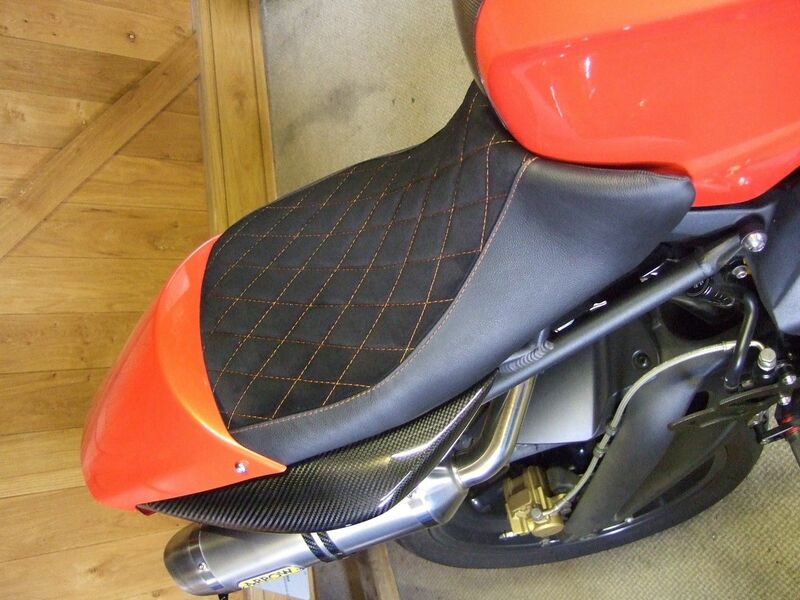 Try your local upholstery company, my local bloke has done lots of motorcycle seats. It's a piece of cake putting on a new seat cover - if I can do it, anyone can do it. I followed this guide for an old Meriden Triumph - the technique is the same for modern bikes. As long as you keep stretching the cover, and work methodically, it's simple. I've recovered a classic bike as well. BTW, you'll need a good stapler - a desk stapler isn't good enough. Thanks for the replies and suggestions as well as the link. I have done many covers over the years but they have all been older classic British of Jap bikes which have fully formed covers and tangs on the seat base to grip the cover. However, with the Sprint seat I am not so confident as it looks like you need to glue the cover to the foam to form the sunken section and then stretch and staple the inner edges. I do not have a staple gun or done this type of cover before so don't want to screw it up? Can somebody suggest a suitable staple gun that would be able to penetrate the hard plastic base? Current staples are rectangular in form, 4mm deep and about 1mm wide. I had a Corbin style seat made on my Sprint 955 & 1050 bases by Dave at Digger seats Newport South wales. I've also had Tony Archer in Huddersfield re-model the seat on my Tiger Sport. Both do a great job & good people. I re-modelled one seat myself, bought a H/D staple gun from the hardware shop which wasn't up to the job, so I hired a bigger stronger one from the local general tool hire place. That worked fine, they didn't have any stainless steel staples so I used what they had & lacquered over them. That might have been a bit of overkill but I keep my bikes a while, didn't want them rusting away. Can somebody suggest a suitable staple gun that would be able to penetrate the hard plastic base? I use a DeWalt DWHTTR350. It's not cheap, but good tools last a lifetime.